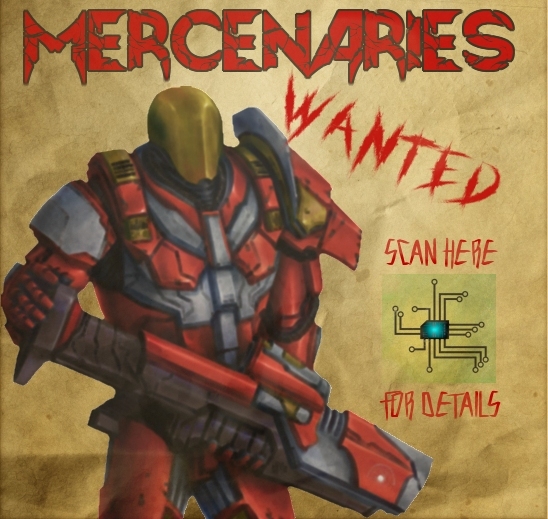 [COMPLETED] [NA X-Faction] Mercenary Soldiers Wanted for Operation: Red Doormat !!! Forums » Looking For RP » [COMPLETED] [NA X-Faction] Mercenary Soldiers Wanted for Operation: Red Doormat !!! Critical Update: This mission has been COMPLETED! Thank you so much for everyone who joined!! The Gold Lotus seeks to Establish itself as a reputable and mutually beneficial commerce partner for all brave denizens of the Nexus stars system. In accordance to the Proto-Neutral Economic Stimulation rulings, we are a fair-opportunity commerce partner with no political or governmental connections. We are currently outsourcing contracts for Conflict Resolution Agents and Skilled Vehicle Pilots to assist in discouraging unnecessarily prolonged renegotiation of material acquisitions. This particular contract is for Operation: Red Doormat, Phase 2 of our competitive response towards conflicting business organizations. Specifications: Contractees should expect heavy resistance by ground agents and weaponized vehicles. After successful shuttle-transport landing, Contractees will be positioned in a dense urban setting and expected to secure primary strategy points by advancing forward. Expect heavily armed resistance of both military and espernetic origin. 2 Class MB6 "Bulldog" Tanks with wall-breaching front grills. Must be willing to shoot and/or tend to injured. Must be capable of driving heavily armored weaponized vehicle. -The Gold Lotus holds claim to any acquired windfall assets, including but not limited to: Cargo, Weapons, Enemy Bodies. At the firms discretion, assets may be gifted or liquidated to provide larger financial compensation for outsourced agents to establish better rapport. - The Gold Lotus is an independent third party not affiliated with any government in accordance to the Proto-Neutral Economic Stimulation rulings, and thus, agents should be prepared to work with other agents from potentially conflicting political views. Agents are not allowed to harm other agents until completion of the contract, when they are no longer represanative of Gold Lotus interests. Payment is in local currency coin. Alternative payment methods, if desired, should be discussed prior with the below listed agent and cannot be guaranteed if discussed after. Agents will be compensated for: Lost limbs, lost eyes, or destroyed organs, resulting from execution of this contract. Free medical treatment is provided at a none-disclosed medical facility. In the event of the agents termination as a result of this contract, their payment share will be forwarded to any names listed as beneficiaries. Successful execution of this contract will build rapport with The Gold Lotus and may lead to future job opportunities. This is for a GM'd (Game Mastered) event planned for Tuesday, November 14th, at 7 PM Eastern, and is expected to run between 3~4 hours! Due to the detailed and turn-based nature of this event, I'm looking for a maximum of 12 or so bodies. Priority will go to those who've signed up! Also, if you think you'll be running late, please let me know! A lot is written to try and preemptively answer questions, but it's a super simple system that's easy to get! Note: Only the natural roll counts for determining Critical Success and Botches. A modified 1 (resulting from - penalties) is a normal failure, and a modified 10 (resulting from + bonuses) is a normal success. Risk: Sometimes, people want to do crazy things which naturally results in higher risk. Risk doesn't increase the chance of failure, but rather, it increases the chance that failure will result in a backfire. If an action is said to have +2 Risk, then that means a natural roll of 1 ~ 3 is a botch, effectively tripling the chances that an action will backfire! Personal Influence Points, or "PIPs" for short, are a token currency that you can spend to 'tilt' the story in your characters favor. Everyone starts every quest with 1 PIP, and PIPs are given out whenever a character endures misfortune (like rolling a 1, or being hurt by someone else rolling a 1) PIPs do not carry over between adventures, so use 'em or lose 'em! To add +1 to any dice roll AFTER it's been rolled (changing a near-miss 4 into a barely-hit 5, for example)! Note: A botch is always a botch. If you have enough pips and + bonuses to turn a natural roll of 1 into a 5, it becomes a 'twisted success' in which you simultaneously succeed at one task while something bad also happens! Note: This particular mission has roles that focus on Ground Combat! Fighter: +1 to Attack Rolls. Can spend 1 PIP to Re-roll a failed (but NOT a botched) attack roll. Healer: +1 to Healing Rolls. Can spend 1 PIP to Re-roll a failed (but NOT a botched) healing roll. Pilot: +1 to all vehicle Attack and Defense rolls. Can spend 1 PIP to Re-roll a failed (but NOT a botched) vehicle attack or defense roll. Mechanic: +1 to Repair and Utility rolls. Can spend 1 PIP to Re-roll a failed (but NOT a botched) Repair or Utility roll. Scout: +1 to Stealth and Utility rolls. Can spend 1 PIP to Re-roll a failed (but NOT a botched) Stealth or Utility roll. These are abilities that let you spend your PIPs to do special actions. Pick out ONE special as a secondary way to spend your PIP points! Focused: Before rolling, you may spend 1 PIP to have your next roll have DOUBLE the effect. If you fail, the PIP is wasted! Deadeye: AFTER a successful ATTACK roll, you may spend 1 PIP to specify where your attack was focused on (Foot, Weapon, Engine, Shield, etc) which may disable or debuff certain actions by that target. It wont increase the damage done, but give a debilitating side-effect as a result of your attack. Multitasker: Before rolling, you may spend 1 PIP to perform the same action (and a separate roll) on another target (attack, heal, repair, etc.) You may spend as many PIPs as you like to hit many targets, but you can't choose the same target twice. Jack of All Trades: You may spend a PIP to Re-roll a failed (but NOT a botched) roll of ANY kind, not just those specific to your Role. Saboteur: As a full action, you may spend 1 PIP to booby-trap a none-living, motionless target (Vehicle, Building, Stationary Weapon, etc.) that you're currently next to. If you do, then starting with your next turn you may set the trap off (preferably after running away) to do 1d5+5 damage to the target. Be warned: If enemies see you set the trap, there's a good chance they'll try to disable it before you can set it off (your utility skill is used as defense for the trap)! Assassin: If NO enemies made an attack against you during the last combat round (thus no hostiles are paying any attention to you), you may attempt to sneak up on a specific target (Stealth roll.) If you succeed, you may spend 1 PIP to automatically hit the target for 3 damage. If you fail the sneak roll, then you do a normal attack with a -3 penalty. Lucky: You don't have a special ability, but you start the adventure with +3 PIPs, making you more reliable at what you DO do! that aside, I am eyeing up joining this. Your system looks fun. Sure! This is a simplified version of a system for a group I've been GMing for (The Mint Julep) but since these missions are open sign up, I wanted to make it easy to jump in while giving enough customization that each person's character brings something to it. Attack: Doing damage to things! Whether it's melee, shooting, karate chopping, or head-butting. But if someone wanted to do something like tackle and pin a character, an attack bonus would help there too. A normal successful attack does 1 damage - for comparison, a minion enemy has 1 life, so an average attack can take out a weak enemy in one hit. Defense: When you get attacked, you make a defense roll (instead of me rolling an attack for the enemy) success usually results in NOT getting hit! Harder enemies will do more damage or have many more attacks per turn. Healing: Recovering people's HP! When a person heals, the amount of HP recovered is half of the damage, rounded up. So if someone had 3 damage, it would heal 2 life back. If they had 5, then a successful heal would recover 3 health, etc. Stealth: For sneaking around unnoticed! The usefulness of stealth is situational and dependent on the player. But, lets say someone wanted to make a sneak attack on an enemy. If they started the round with no enemies specifically focused on them, I'd say make two rolls - the first is a sneak roll (to quickly approach the target without being noticed) and the second is an attack roll. If the sneak roll succeeds (5 or higher), then the attack roll gets +2 to hit and +1 damage (double damage) - but if the sneak roll fails, the enemy hears the player coming right before the attack, and the attack roll gets a -3. If the player had the "assassin" special and a free PIP, they could opt to spend the pip right after the successful sneak roll to get an auto-hit of 3 damage (which is a LOT in my system) --- this scenario isn't set in stone though! If a player tried to sneak up on an enemy that was attacking them, or while out in the open while enemies were firing at them, then they'd get greater penalties to their sneak roll. Utility: Utility, in this case, is my catch-all 'fiddlin with stuff that doesn't fall into the other categories' skill. Disarming or setting traps - hacking a computer - bypassing a security door - using an auxiliary system on a ship (like sensors). There's wiggle room for overlap too. Like if someone is using a massive gun turret on a ship - the +1 from piloting or the +1 from being a soldier would both apply. Likewise, if a mechanic (repair +1) and a scout (utility +1) were both trying to prevent a ship's systems from being taken over by a hostile hacker, either bonus would apply. It's all common-sense-y. That's a real word now. Your role doesn't limit what you can do. Healers can still attack, soldiers can still heal (I'm sure they've got medkits on them) mechanics can still try to sneak up on enemies and whack em with a big wrench. Players tend to think up things I'd never expect them to do, so a lot of it is on-the-fly judgement. I'd say just pick the two things that 'sound' the most like your character! Will update closer to the date, currently unknown how my work Schedule will affect me. Edit: If needed, Mica can be a driver to open up a spot on the list. I might switch his role to "Pilot" in that case. Thanks! That helps a lot! EDIT: ahhh! I just saw that it's filled up while I was waiting to get back to you on my question D: Do I still have a spot? Brigid Bree: Soldier , Tenacious. Or a Tank Driver due to being filled.